Sarcoma treatment and surgery India offers information on Sarcoma Doctor India, Sarcoma treatment and surgery Hospital India, Sarcoma treatment and surgery Abroad, Sarcoma causes, symptoms, Risk factors, treatment and surgery. Fibrosarcoma - Fibrosarcoma is a malignant tumor that arises from fibroblasts (cells that produce connective tissue). This is a type of sarcoma that is predominantly found in the area around bones or in soft tissue. Myxofibrosarcomas - This is a type of fibrous sarcoma and the most common type of sarcoma in older people. They were previously called malignant fibrous histiocytomas (MFH). It is not clear which type of cell they start from. Myxofibrosarcomas can affect any part of the body, but most commonly occur in the arms or legs. Desmoid tumors - Desmoid tumors arise from connective tissue - the cells involved with the formation of muscle, fibrous and nerve tissue. Desmoid tumors, also called aggressive fibromatoses, are locally aggressive. This means that they can grow into and even destroy adjacent normal tissues, even bones. They do not, however, have the capacity to spread distantly (metastasize) throughout the body. Hence, most doctors consider desmoid tumors to be benign and not malignant. Liposarcomas - These sarcomas start in the body’s fat cells. They can grow anywhere in the body and most commonly affect middle-aged people. Some grow very slowly (taking many years to develop) and others more quickly. Synovial sarcomas - Synovial sarcomas usually start near to joints, such as the knee or elbow, but can occur in any part of the body. They usually appear as hard lumps and are more common in younger adults. Rhabdomyosarcomas - Rhabdomyosarcomas grow in the active muscles of the body that we can control. These muscles are known as skeletal muscle or striated muscle. Rhabdomyosarcomas occur mostly in the head, neck and pelvis, but can occur in the arms or legs. There are three sub-types of rhabdomyosarcoma: embryonal, alveolar and pleomorphic. LeiomyosarcomasLeiomyosarcomas start from smooth muscle that is not under our conscious control. Smooth muscle is also called involuntary muscle and forms the walls of the womb, stomach, intestine and the blood vessels. Leiomyosarcoma is one of the more common types of sarcoma and can occur anywhere in the body. Malignant peripheral nerve sheath tumours (MPNST)These sarcomas arise in the cells that cover nerve cells and can occur anywhere in the body. The cells around the nerve cells are called schwann cells. MPNST can also be called malignant schwannomas or neurofibrosarcomas. They most commonly occur in people who have a rare genetic disorder called neurofibromatosis (von Recklinghausen’s disease). AngiosarcomasAngiosarcomas start from the cells that make up the walls of blood or lymph vessels. If they develop from blood vessels they are called haemangiosarcomas. If they start from the lymph vessels they are called lymphangiosarcomas. Angiosarcomas sometimes arise in a part of the body that has been treated with radiotherapy many years before. Gastrointestinal stromal tumours (GIST)GISTs are sarcomas that develop from the connective tissues in the walls of the digestive system. The digestive system is often called the gastrointestinal (GI) tract. This type of tumour may also be called GI stromal sarcoma. They behave differently from other types of sarcoma and are treated very differently. Kaposi's sarcoma (KS)Although Kaposi’s sarcoma is a type of sarcoma, it differs from other sarcomas in the way it develops. It starts from cells in the skin. Coloured patches or lumps can develop in the skin, in the mouth, and in the lymph nodes or internal organs such as the lung, liver or spleen. Kaposi’s sarcoma can affect people with a weakened immune system, including people with HIV and Aids. Other types can affect people of Jewish, Italian and West African origin. Kaposi’s sarcoma is treated differently to other types of soft tissue sarcoma. Age Soft tissue sarcoma can be diagnosed at any age, but is more likely to develop in people over 30. Radiation Radiotherapy given as a treatment for other cancers can sometimes cause a sarcoma to develop years after the original treatment. This is because the radiation can affect healthy tissue in the treated area. A radiation induced sarcoma will not usually develop for at least 10 years after the original treatment. This is quite rare. Neurofibromatosis is a genetic disease that causes non cancerous (benign) tumours to form in the nerves under the skin and in other parts of the body. But the risk of getting a very rare sarcoma called a malignant peripheral nerve sheath tumour is increased. About 15% of people with neurofibromatosis will have one of these cancers. Li Fraumeni syndrome is a genetic syndrome that causes many cancers to occur in the affected families. It is sometimes called family cancer syndrome. Families with Li Fraumeni syndrome are at a higher risk of breast cancer, brain tumours, leukaemias and other cancers. They are also at a higher risk of developing soft tissue sarcomas. Retinoblastoma is a type of inherited eye cancer. It is nearly always diagnosed in childhood. Children who have had retinoblastoma also have an increased risk of developing a soft tissue sarcoma in the future. They also have an increased risk of getting a bone tumour (osteosarcoma). Treatment of Sarcoma Cancer in India Treatment options for soft tissue sarcomas include surgery, radiation therapy, and chemotherapy. The specific treatment plan for your child will depend on the stage of the cancer, which is based on size and grade of the tumor and whether it has spread to other parts of the body. Surgery is the most common treatment for soft tissue sarcomas. Your doctor may remove the cancer and a safe margin of healthy tissue around it. 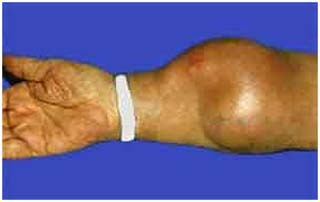 Depending on the size and location of the sarcoma, it may be necessary to remove all or part of an arm or leg but amputation is rare. In most cases, radiation or chemotherapy is given before surgery to shrink the tumor or after surgery to kill remaining cancer cells.